Some groups are taking a temporary break. We’re sorry but registration is not currently available for OnTrack. But registration is available for OnDemand, Engage, Advance One. and Advance Two. You can join our waitlist to express your preferences and be the first notified when we resume. If you are new to the iDiet, you have the option of purchasing the book, “The ‘I’ Diet,” by Susan B. Roberts, which is available on Amazon or Barnes and Noble online. This is an affordable way to introduce yourself to the iDiet, and to try many wonderful recipes. Make sure you are on our email list to receive updates. 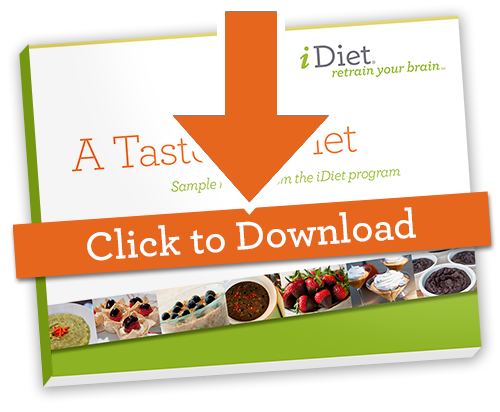 Upon signing up, you’ll also receive a free sample iDiet cookbook. Aside from the great food, in iDiet group classes, you learn many other techniques and healthy habits that will stay with you the rest of your life. Our certified Group Leaders customize an eating plan for you, help you choose your meal plan based on foods you most enjoy, and help you constantly adjust your plan as you lose weight and your body and preferences change. Being in a group keeps you accountable, on track, and losing weight at the maximum healthy rate, so you lose fat but not muscle. You too can succeed without stalling out or giving up, and you can keep your weight off — for life. Why not sign up for an iDiet online group today? Created by Susan Roberts, PhD, of Tufts University, the iDiet is based on advanced clinical research and helps dieters change their total approach to food, without hunger and without deprivation. Dr. Roberts, author of the groundbreaking book The “I” Diet and more than 200 clinical studies on nutrition and weight loss, decided she had to spend some time outside of the lab and also be a “diet doctor”, because she had discovered the best ways to achieve lifelong weight loss — and transform lives — and wanted to share her knowledge. Discover how the iDiet can help transform your life too. Give us a call, drop us a note, or register for a class today and start your transformation.